Japanese sake, for the average Westerner, can be mystifying. What exactly is it, how does one drink it and how did it come about? In this beginners guide we will answer all of these and more as we unveil this 2,000 year old drink from the orient. There are two things you should know before we embark on this sake demystifying journey. The first being that the Japanese call it rice wine and it’s marketed as such. The term ‘rice wine’ is deceptive because it leads to many Westerners believing that it’s a wine made from rice. Yes, it contains rice but also yeast and unlike wine it’s brewed and therefore has far more in common with beer. The second thing to keep in mind has to do with the word ‘sake’. In the Japanese language the word translates to ‘alcohol’ so this means that walking into a Japanese bar and asking for sake is the equivalent of walking into a Western bar and asking for alcohol. Bartenders need more specifics than that and rightfully so. The correct name for sake is nihonshu, which translates to ‘Japanese alcohol’. So, as a general rule, when outside of Japan call it sake but when inside of Japan call it nihonshu. Keep exploring by using the table of contents below as a quick navigation guide. What is the alcohol content of sake? This Video is owned and created by Letters from Japan. Visit their website here and their Youtube channel here. How sake came about is a topic of debate with some even speculating that it originated in China. What is known with absolute certainty though is that it’s been produced and consumed in Japan for at least the last 2,000 years. It has, as a result of such an extensive history become deeply ingrained in not only Japanese culture but also in Shintoism, the national religion of Japan. This is evident in the countless sake barrels donated to Shinto shrines each year as well as in the large scale consumption of it at religious festivals. Sake is even called the drink of the gods and drinking it is seen as a form of unification between man and the gods. Before we delve into the topic of how it’s made we will first take a quick glance at each of the ingredients that goes into a bottle of sake. Rice is the most important ingredient and without it sake just wouldn’t be sake. Any type of white rice is suitable for sake production but the two most commonly used varieties are Japonica and Sakamai. Sakamai translates to sake rice and is a non-edible variety specifically grown for sake production. There are more than 100 varieties of it grown in Japan. Sake breweries use only the highest quality water which is why most of them are located right next to or very near a mineral enriched fresh water source. The ideal water is rich in potassium, magnesium and phosphoric acid because these minerals play a vital role in assisting the propagation process of the yeast and koji mold. Yeast converts sugar into alcohol and the type used plays a significant role in not only the way sake tastes but also affects its aroma. Mold has a bad reputation because it’s an allergen and some species are even downright toxic. Koji mold, on the other hand, is perfectly safe and is an essential ingredient as it converts rice starch into sugar. Japanese sake is naturally sweet. Some acidity is need to counteract the excessive sweetness which is why lactic acid gets added. Other benefits of this ingredient includes preserving the flavor and killing germs. Most sake brands have distilled alcohol added to it but this was something that was never done before world war 2. Food shortages during the war demanded rice farmers grow rice for food consumption instead of for luxuries like sake. Brewers, as a result of rice shortages started adding distilled alcohol to their batches to increase yield. The war is long over, rice is in abundance, yet the habit continues to this day but for different reasons. Whereas before it was added to increase output, today it is added to give enhance the flavor. It’s worth noting that premium sake contains considerably less distilled alcohol than the non-premium brands. So how do these ingredients come together to create a drink that even the gods are highly fond of? In the first step of making sake, rice is taken and milled down to a certain percentage. The percentage can range anything from 30% to 70% depending on the brand. For example, rice with a 30% polishing ratio has 70% of its outer layer removed whilst rice with a 70% ratio has 30% removed. The outer layer of rice granules are made up of fat and protein while the inner core contains starch. The less fat and protein in the sake the smoother and more refined the taste will be. After the rice has been polished down to the desired percentage it gets washed. Next the rice get soaked for a certain period of time to absorb as much water as possible followed by steaming. The rice is then cooled down and spread out onto a table. Koji mold spores are added and mixed into the rice. The batch gets covered with cloths to keep the temperature consistent and then left for a few days while the mold grows onto the rice granules. The purpose of adding koji mold to the rice is so that the enzymes produced by the mold can transform the rice starch into sugar. And remember how the rice was soaked to absorb water? The reason behind it is so that the mold can grow faster because it needs dampness or a water source to grow. Sake is made from the finest ingredients such as high quality non-edible rice, fresh mineral enriched water from a natural source, koji spores and yeast. In the first step the rice gets milled down to a certain percentage (depending on the brand and variety); this is an extremely delicate process as the rice can easily get damaged if too much heat is used. The rice is then thoroughly washed and allowed to soak up water before it gets steam cooked. Koji mold spores are then added to the batch along with yeast for the fermentation process. The mash gets aged for around 18 to 32 days after which it gets pressed, filtered and blended. Can’t tell a Junmai apart from a Honjozo? Don’t worry! 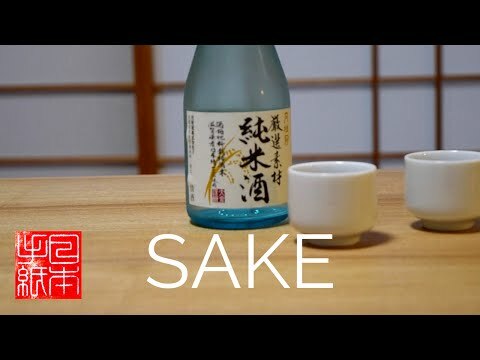 In this section we will explain how the different types of sake are made and how they differ from one another. Junmai-shu is a high acidic premium drink strictly produced from at least 70% milled rice, water and koji mold with no distilled alcohol added. The lack of added brewer’s alcohol is what helps bring out its rich full rice based flavor. Junmai-shu, depending on the variety can be enjoyed warm, cold or at room temperature. Honzojo-shu is made with the same ingredients as Junmai-shu, including the same degree of rice milling (around 70%). However, it’s much smoother and has a considerable higher amount of noticeable fragrance thanks to the added distilled alcohol. For a sake to qualify as a honzojo-shu the weight of the added alcohol must not exceed 10% of the rice weight – although many of the best honzojo-shu brands contain a lot less than the maximum 10% allowance. It’s a premium grade drink that is best served warm. Many varieties of ginjo-shu are popular for its fresh aroma and fruity taste but keep in mind that not all types share these traits. It undergoes a lengthy and rather labor intensive production process where the rice gets milled to 60% levels. The fermentation process takes somewhat longer than other sake types and takes place under much colder than average temperatures. Some brands of ginjo-shu are ideally served cold while others are better at room temperature. Daiginjo-shu has a lot in common with Ginjo-shu and is considered to be a subclass thereof. It follows a slightly more rigorous production process and the rice gets milled to 35% – 50% levels. Daiginjo-shu, according to many sake enthusiasts is the apex of sake brewery. There exists many varieties of this type but most tend to be predominantly light and carries a very pleasant and sweet smell. It’s best enjoyed cold or at room temperature. Namazake goes by various names such as Fresh and Nama Sake. The word Nama in the Japanese language means ‘raw’ or ‘natural state’ and when applied to sake it refers to it being unpasteurized. All other brew’s undergoes a pasteurization process where it gets heated up to around 149 °F (sometimes twice per brewing process) in order to help preserve the brew by destroying the enzymes. Namazake isn’t a standalone sake, instead you get it as a version of Daiginjo-shu, Honjozo-shu, Ginjo-shu and Junmai-shu. Many people describe namazake as being easily distinguishable from pasteurized types with a refreshing fruity taste. More importantly, this variety should always be kept cold – both before and after opening. Reason being that it did not undergo heating during the pasteurization process, so therefore it still contains enzymes which could become activated and spoil when stored under warm conditions. Nigori, otherwise known as nigorizake is a light flavored brew with a very fruity taste. The word nigori translates to ‘cloudy’ and got the name for its cloudy appearance. Most brew’s undergoes a filtration process to remove fine rice particles from the drink but nigori is whats known as an unfiltered sake. Nigori is stored and served chilled; it’s also advised to shake the bottle before serving to stir up the fine rice particles which gives it that unique, dreamy cloudy appearance. Nigori goes perfectly with spicy foods since its regarded as one of the sweetest sake’s available. The sparkling version of this ancient Japanese drink is a relatively new concept and only began gaining popularity among the younger generation, sake beginners and females in 2010. Most varieties of sparkling sake has a beautiful combination of sweetness and sourness with an alcohol percentage level of below 10%. There are currently just over 100 brands of the sparkling kind and many describe it as being extremely similar to champagne. As previously mentioned, sake has a 2000 year long history with Japan but its only been recently (30 to 40 years ago) that certain types started being served chilled. Before, it was common practice for it to be consumed warm or at room temperature. As a general rule, premium versions are served chilled while the more common ones are best served warm – although there are exceptions. Advancements in the brewing process negatively affects the taste of certain types when served at higher temperatures. Likewise, being served too cold may also hinder the taste. Use the table below as a recommended guideline on ideal sake temperatures. There are four ingredients used in the production process. The main ingredient is saka mai (sake rice) which is strictly used for brewing and not eating. Interestingly, there are around 80 varieties of this special rice in existence. Water also plays an essential role in the process as its used in most stages of production from washing saka mai to diluting the final product. Mineral enriched water from natural sources is most preferred especially when it comes to premium sake. Other ingredients include yeast and an enzyme producing mold known as koji. In Japan, the process of heating sake is called ‘Okan suru’ and can be performed via various methods. It’s important to get the temperature right because if the sake gets too hot it could make it dry and even ruin the flavor – so you only get one shot at it. You might also want to invest in a good quality sake thermometer and remember that the ideal temperature depends on the type of sake you have. If heating sake via the stove method you will need a decanter. Fill the decanter 90% of the way and put plastic shrink wrap over the opening to prevent the aroma from escaping during the heating process. Put a pot onto the stove and place the decanter inside of the pot. Put just enough water in the pot for the decanter to be 50% emerged. Remove the decanter, put the stove on and wait for the water to boil. Once the water is boiling turn the stove off and place the decanter back into the pot. Keep the decanter in for 2 to 3 minutes at a time while checking the temperature with a thermometer until it reaches the right temperature. The microwave method is risky because its easy to overheat. Pour the sake into a decanter and put it into the microwave. The same rule of placing plastic shrink wrap over the mouth of the decanter applies here too in order to preserve the aroma. Set the microwave to the 600W setting and turn on for 20 seconds. After 20 seconds remove the decanter and swirl the sake around a bit to help spread the heat around evenly. Place the decanter back into the microwave and continue heating. There is no set time limit for how long you should keep your sake in the microwave so keep checking the temperature periodically. Sake can and does go bad. When unopened bottles are stored in cool, dark places the shelf life can increase dramatically but it also depends on the type. Most types have a shelf life of 2 years when stored correctly and unopened so be sure to check the release date on the bottle. The older the bottle the more of the taste gets lost so its always advised to drink it as fresh as possible. It’s recommended to finish the bottle within a few hours of opening to get the best quality. If you cannot finish the bottle within a few hours of opening then store it in the fridge and consume within 3 to 7 days. Most types are brewed at 20% alcohol levels but gets diluted down with water to levels ranging from 15% to 16% – however, there are exceptions. The sparkling variety is known for having lower levels (13%-15%) while the Echigo Samurai brand contains levels of 46%. It’s often called Japanese rice wine, although its not actually a wine but it does taste similar in some ways. It’s important to keep in mind that there are an estimated 40 000 to 50 000 sake brands with most of them tasting different from one another. The varieties are endless and depending on the brand can taste like strong alcohol, melon, strawberry, citrus, apple, cinnamon, nuts, rice, honey and lots more. Unfiltered sake is commonly known in Japan as nigori / nigorizake and the word translates to ‘cloudy’. Most other types undergoes two filtration processes to remove the fine rice particles which results in the liquid having a clear appearance. However, unfiltered versions bypasses filtration thereby giving the liquid a cloudy appearance. It’s common practice to shake the bottle before serving which stirs up the rice particles giving it that unique cloudy appearance. How does cooking sake differ from other varieties? Cooking sake does not differ a lot from the drinking types; as a matter of fact, a decent quality drinking sake can be used for cooking purposes. The only differences with the cooking variety is that it has lower alcohol content, underwent a high rice polishing ratio and has some added salt. Sake sets are called shuki in Japanese and consists of a flask which contains the brew and cups to drink from. The sets are usually made from ceramic but can also be wood, glass, metal or plastic. Wooden sets used to be popular a long time ago as it had a pleasurable effect on the taste; however, in modern times this is not the case with brewers who produce premium brands as they do not want anything to alter the taste of their drink. Three different sake cups; one of which is a masu. Tokkuri: A tokkuri is the container vase which holds the sake. It can also be used for heating and the long, thin neck helps to keep the brew warm. These vessels usually holds up to 360ml at a time and comes in many different styles. Ochoko: The small containers are what is known as ochoko. Most are narrow at the bottom but becomes wider towards the top and the reason for this is so that the aroma can easily travel upwards. They are available in various colors and sizes. Guinomi: A guinomi is exactly the same as an ochoko but only smaller in size and with a curvier shape. They can be used for drinking but are also popular as collector items among sake enthusiasts. Guinomi’s are considered to be a less formal way of drinking as opposed to ochoko’s. Masu: A masu is a wooden box originally created during the Edo period to measure soy sauce, sake, vinegar, as well as rice and other grains. It was eventually used as a sake drinking cup but is no longer a popular choice since it interferes with the taste and smell of premium brews. It is however, still in use today with traditionalists at izakaya’s (traditional Japanese pubs) and at special ceremonies. Masu’s typically come in two sizes – 144ml and 180ml. There are a few things to remember whenever drinking in a Japanese social setting. As with most things in Japanese culture there are a certain set of rules to follow. The first is how you hold your ochoko / guinomi (drinking cup). The cup is traditionally held in your left hand with the pinky finger supporting the base of the cup. Secondly, never pour your own drink. It’s customary in Japan to pour for others and to have others pour for you. It’s good practice to show courtesy as someone is pouring for you by holding your cup with both hands and by not looking around as the other person is pouring. Seniority and status matter – especially at a business related or a work event. If the person you are pouring for is of senior status then pour while holding the flask with both hands. If pouring for someone of junior status then its perfectly fine to pour for them with one hand. Awamori is a healthy alcoholic drink from the Ryukyu Kingdom. Learn more..
Shochu is the most popular alcoholic beverage in Japan, yet most people.. Check out these 6 incredible whisky distilleries in Japan you can visit.. Learn about the different methods of heating at truesake.com.